On this blog, I’ve often referred to Mike Huckabee’s comment that, when confronted with the modern news of various states allowing gay marriage, Jesus would have “wept.” This characterization of Jesus as anti-gay is fairly common among those who use the Bible to support Anti-gay stances. This is strange, for Jesus never mentions homosexuality. Ever. Period. He does mention avoiding sexual immorality, but what this means is up for debate—cheating on your spouse, for example. Also common—as I mentioned last post—is the prevailing image of Jesus as a peace-loving figure. Well, as people who promote such an image likely know, the New Testament provides a much more complex image of Jesus—he’s wasn’t all peace and love all the time. In fact, he had a mean streak, as the twice-repeated fig tree story in the Gospels demonstrates. Among other things, this story caused me to question the image of Jesus employed by people for their own needs—they were being selective in the Jesus they represented. In Zealot, Aslan deepens the complexity of Jesus’ character by exploring his use of force. Leading his people, he sought a revolution for the kingdom God had been establishing through the Jews (in the Old Testament), and he wasn’t concerned about being nice in the process. As Aslan states, “The Jesus of history had a far more complex attitude toward violence” (120). As Matthew states, Jesus came to Earth to bring the sword (10:34), which forms the basis of the aggressive image of Jesus in the Bible. The manner in which Aslan develops this impression is interesting. This aggressive image of Jesus was, according to Aslan, a problem, for it represented the revolutionaries who, exhibiting Jewish nationalism, contributed to the Jewish Revolt and ultimate destruction of Jerusalem. Wanting to distance Jesus from this type of association, “phrases such as love thy neighbor…were deliberately cleansed of their Jewish context” (121) so that they applied to everyone. But Aslan emphasizes: Jesus was Jewish, not a Christian. His mission was concerned with Jewish lives; therefore, when he said love thy neighbor, he meant love thy JEWISH neighbor (121). He advocated staying AWAY from gentiles (Mathew 10:5-6)—not so lovey dovey after all. He also was not afraid to take up arms in order to defend the Jews from outside influence. And of course, when he arrived at the Temple in Jerusalem, he didn’t call a meeting to discuss issues, he went and forcibly cleaned house. Furthermore, Jesus, as a practicing Jew, was following the letter of the law (for the most part), which meant Old Testament/Torah. Now, that God was violent and had zero qualms about wiping the enemies of Israel from the Earth—no mediation, no hug it out, etc. As Aslan discusses, as the son of this God, Jesus was also a follower, and the only God he worshipped was THIS God (122). Exodus is filled with warnings about the non-Jews occupying the chosen people’s land and what bad things are coming their way. Given this lineage, why would Jesus have believed in turning the other cheek? Why wouldn’t he have resorted to violent means in order to save and protect his people? So Aslan points out, by preaching the word of God, what he was really advocating was a radical new Jewish world order, one that would only be achieved through violent means. This is why he was crucified, for during that era, crucifixion was a punishment for sedition. Aslan emphasizes that this fact supports why it should not be understood as a symbol of self-abnegation (124). So does this information denigrate Jesus? I don’t think so. After all, he did bring about change. I would say that the issue is that once he died, he became a symbol—perhaps the ultimate symbol—and in so doing, he was shaped to embody and represent what the people in charge wanted him to represent. His violent, aggressive side was scrubbed, leaving a more peaceful figure. He seems to work well as this, and the idea of him in this role apparently brings a lot of comfort to millions of people. This is great. My problem is when this incomplete impression is presented as complete and then this new version is credited with saying things he did not say and represented in ways that are not completely accurate. When the LGBT community is shunned as a result, that’s a problem. Next up: Understanding Jesus’ true audience. It dictated what he was really saying. 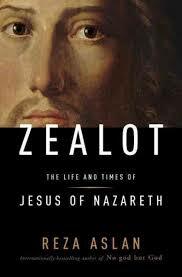 This entry was posted in Aslan's Zealot and tagged Aslan's Zealot: The Life and Times of Jesus of Nazareth, Brad Windhauser, Jesus, New Testament, violent Jesus. Bookmark the permalink.